Bag of Parts, Enclosure w/ hardware, Printed Circuit Board, Schematic Diagram, Parts list and Layout page. There are some minor instructions on general soldering and usage. More details can be found with this Xtal-Tester-Instructions PDF file. Assembly was pretty easy by matching up the correct part on the bill of material, matching it with the silkscreen, and soldering in. The bill of material was lacking resistor color codes and the resistors were of the 1% variety so it’s best to use a DMM to check the resistor before installing. The resistors PCB pads were also spaced at .3″ having to bend the leads right at the body of the resistor, a .4″ spacing would have been preferred. A HUGE problem with this build was the quality of the PCB. Either the PCB has a great deal of moisture or out-gassing causing the solder to bubble like an old fashioned coffee pot. This can cause poor solder joints and even worse solder splattering onto your skin or eyes! 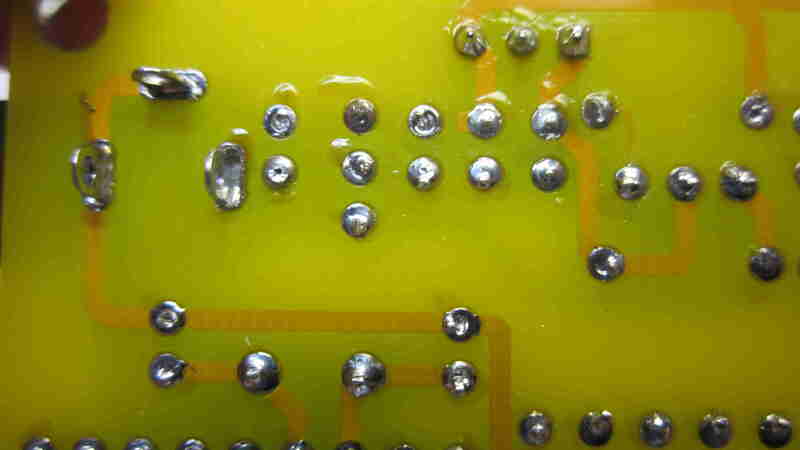 Below is a picture showing the results of the poor solder quality due to out-gassing. Notice the pot holes and craters and even possible cold joints. The supplied enclosure looks pretty neat although the 2 smaller side pieces were difficult to fit in (very tight), you may find a little sanding or filing needed for the tongue/groove joints. Using the extra supplied nuts worked great for PCB mounting standoffs although I would have preferred lock nuts or lock washers to be included. Not using locking hardware seems to be common in these cheap kits as my Anet A8 3D printer was also lacking in this respect. I mainly bought this for a quick go/no-go crystal tester. Additionally the counter has a unique feature which could possibly make a nice digital VFO display, although I won’t count on it being accurate down to the KHz. 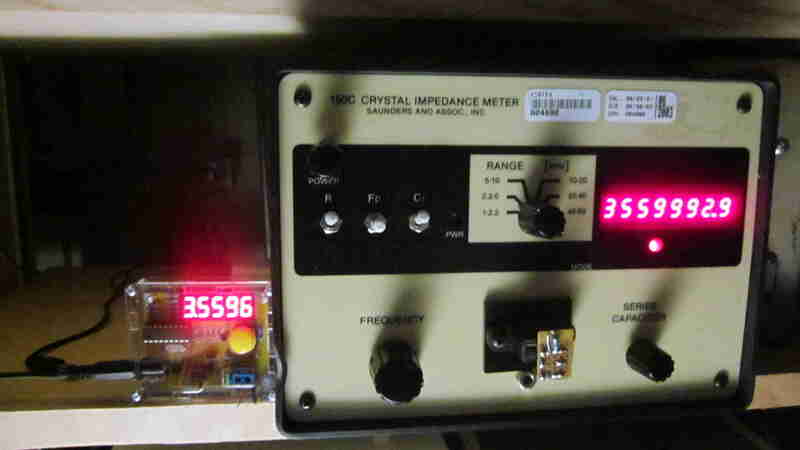 Since a crystal tester is based on a frequency counter the counter side was looked at first. The counter works but falls short of expectations. The frequency reads low, as much as 4KHz at 14.1MHz (see photo). Although it claims to count to 50MHz it became very picky above 12MHz and could not obtain a consistent read or read at all above 20.5MHz. The instructions also claims to not exceed 30V (ACp-p? ), a blocking diode will prevent negative voltages and the PIC specifications for this pin shows a 14V maximum. This appears to want a TTL level signal (between 0 and 5V or with the blocking diode 5.7V). Since I am unfamiliar with PIC’s (I’m an AVR fan) I did not delve further into the data sheet. In testing only values to +8.5V maximum was used with the best counter results occurring in this 0/8.5V value. In most cases the signal generator was placed at +2.5V and peak-to-peak amplitude adjusted. 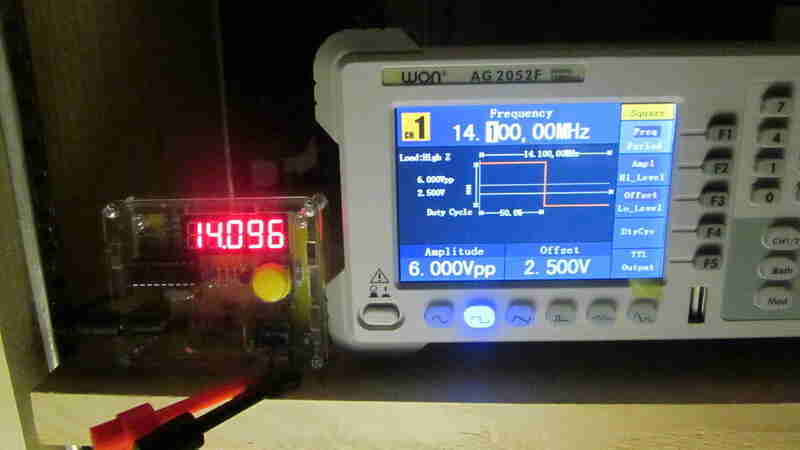 An interesting feature is the ability to enter an offset frequency for use as a VFO display. The down side is since there is only 1 button for programming the offset frequency MUST be generated with a signal generator in the ADD or SUB programming mode. If you don’t happen to have a generator or local oscillator available to meet the voltage requirements to do the programming then your out of luck. Additionally with the input levels noticed above, be prepared to create a buffer/amplifier stage between your VFO and this counter. For testing crystals we took a variety of HC49/S package crystals of various frequencies and compared them against a Saunders 150C crystal impedance meter. The little machine pin socket provided, along with the enclosure height limits testing to HC49 wire lead type crystals with at least 1/3″ of lead length. If you have short leads or other packages such as HC6, FT-243, or SMD then an external fixture is needed. In most of the cases all of the crystals measured low from around 400Hz to almost 5KHz depending on frequency. Still it oscillated everything from 3.560 to 28.060MHz which makes it a quick go/no-go type of tester. 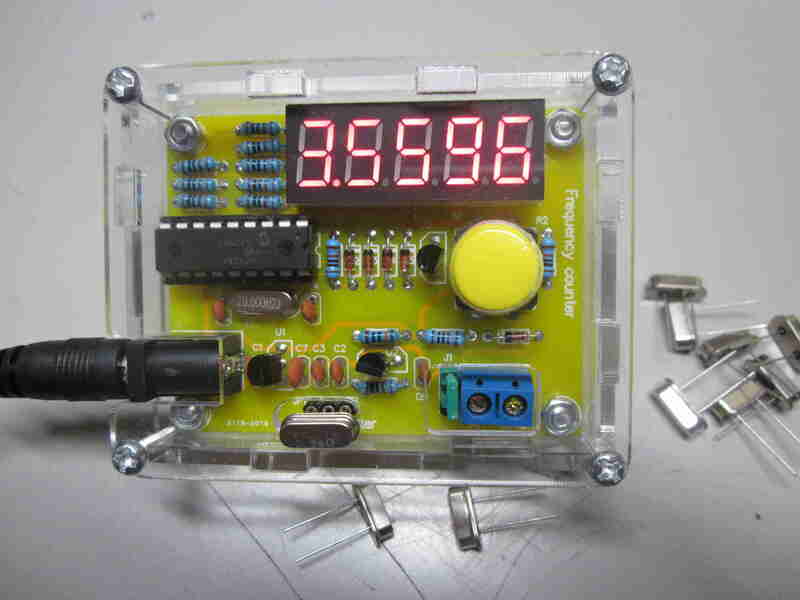 A fun little kit as a go/no-go crystal checker or ballpark frequency counter but falls short on accuracy and counter range (what do you want for $10? ).